Houzz 321 of our visitors have told a friend about this plan. This rustic home blends brick, stone, shake siding, and timber columns for a striking exterior. The foyer leads you to the Great Room with its vaulted ceiling and fireplace. The perfect area for entertaining, your guests will enjoy the curved eat-at island bar of the kitchen. And open the French Doors of the Great Room to the Outdoor Living/Grilling Porch with a cozy fireplace of its own. The Master Suite offers an optional door to the porch and a huge walk-in closet. The bathroom features double vanities, a corner whirlpool tub, and a corner glass shower with seats to ensure relaxation. On the other side of the house, you’ll find bedrooms 2, 3, and 4, each with a walk-in closet and sharing a bathroom. Upstairs there is a huge bonus room that would be perfect for another bedroom, with a full bathroom, and a large walk-in closet. Question: Do you have this plan with a kitchen nook for a table? Answer: Hello, you might like 82430. Question: What are the dominations of the master closet? 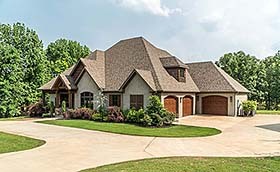 Question: Does this house plan have a walkout basement available? and can you send me a image of basement plans? Answer: Hello and thanks for your inquiry – Yes an optional basement is available. It is an unfinished basement area under the main floor heated/cooled. The stair access is on the backside of the stairs going up. Question: Do the house plans spec the exterior materials? Answer: Yes. The elevations call out the exterior materials. Question: Good Afternoon, Do you have this plan available where the two car side entry garage is a three car side entry so there would be a total of four garage spaces? Answer: This is not currently an option available. However, we can certainly modify the plan to create what you want. Question: Hi if I wanted all area to have a minimum 10' ceiling height could that be accomplished by just ensuring all top plates are framed with 10' studs? Or would the plan need reworked? Answer: yes, simply use 10 walls as opposed to the 9 foot. many folks do this onsite. thanks for choosing our home design! Question: This is the house plan I will be building soon. I see that the great room is vaulted. Is there any way the kitchen, dinning room, and master bedroom be vaulted also? If not how tall are the ceilings in all the rooms or how tall could they be? Answer: hello and thanks for choosing our design! the house is designed with a nine foot ceiling throughout EXCEPT where noted. this can be done but may be tricky depending on how seasoned a builder and/or framers you use for your new home. You must ask your builder. Answer: Hello Darren – the basement access is on the opposite end of the stairs; if you want the stairs inside house simply move the garage to house door down. Question: Hi, I've read the questions and comments and I'm looking at the plan to try and determine the answer. When you said the basement entrance would be on the backside of the bonus room stairs, so would the single garage be moved to the back door of double garage? Question: Do you have a design for a finished walk out basement? Moreover, where would the stairs be located to go down to the basement. Answer: Happy Friday! Thanks for your interest in our home design. The basement access is on the backside of the bonus stairs; we can move the Garage to house door so the basement access is within the h/c space. Since the basement foundations are optional we do not have a general layout Showing windows or doors. The space available in directly below the heated/cooled space on main floor. Question: Do you have a floor plan/design for the walk-out basement for this design? Answer: Hello and thanks SO much for your inquiry. Since the basement foundations are optional we do not have a general layout Showing windows or doors. The space available in directly below the heated/cooled space on main floor. Question: The plans show an option of a arched opening balcony in the bonus room which would more or less be over the double garage with the area over the kitchen open to the roof line. However, the real life pictures show the kitchen with recessed lighting in a ceiling over the entire kitchen area. I love the idea of the recessed lighting but I also love the idea of the balcony. Did they just increase the size of the bonus room to accomplish this? Thanks for any help! Question: Could you put a safe room under the stairway or where could you put a safe room? Answer: A safe room on the main level needs to be in an area that will allow 8" concrete walls as well as enough space to actual consider a safe room. Typically, if space is limited and a safe room is not to be modified to plan, a walk in closet for example could be a location for a safe room as it’s closed off as well as can accommodate the 8” concrete walls necessary to have safe room as well the space for safe keeping. On the plan below, suggested area to incorporate a safe room on main level will be the master suite closet; other locations that is possible but not recommended is bedroom 2 closet (faux window ) and possibly the laundry room; otherwise a safe room concept will need to modified to plan. Question: how big is the master closet in this plan ? Question: Are the timber beams in the great room and outdoor living area vaulted ceilings for structural strength or for looks? Answer: Thank you for your interest in our home plan design. The timber beams are decorative and are not structural. This is a rustic style home plan and the timber beams accentuates that style. Plans can be built without the decorative beams. Question: what is the total overall sqft of the first floor? Answer: Thank you for your interest in our home plan design. The main floor sq ft is 2470, garage and storage 1069 sq ft (not h/c), porches 564 sq ft (not h/c) equaling total under roof 4103 sq ft. Bonus space is optional sq ft which is 602 sq ft that if added to total living space will be 3072 sq ft h/c space. Question: What is the maximum ceiling height in great room and kitchen? Thank you for your interest in our home plan design. There is a 10’ plate line in the great room/kitchen area; the vault can be maximized as high as the space above (attic space) will allow starting from that plate line. This can be determined on site by the builder to suit the specific height range that is desired. Consider having the ceiling height raised, if you would like to have an even higher ceiling. If this option is something that you may consider, please email your feedback.